Obituary – McQuain, Georgia Belle (Stevens) « Perry High School Alumni Association, Inc.
﻿Mrs. Georgia McQuain, 70, who lived at the south edge of Perry along state highway 86, died at 4:30 p.m. Friday in Stillwater at the home of her daughter, Mrs. J. F. (Donna) Richardson. Funeral will be at 2 p.m. Monday at the First Baptist church in Perry. Officiating will be Rev. John Meadows, Tulsa, formerly of Perry. Burial will be in Grace Hill cemetery under direction of the Parker Funeral home. Memorials have been established for the Natalie Bryant Cancer center at Tulsa and for the First Baptist church of Perry. Mrs. McQuain had been in ill health the past several months. She was born Oct. 17, 1912, in Noble county; the daughter of Jacob and Ada Stevens. She was a graduate of Perry high school and had additional schooling in Kansas. She was married in Chandler March 12, 1932, to Martie McQuain, who preceded her in death in 1979. She had assisted her husband in operation of several businesses. A member of the First Baptist church of Perry, she was a past president of the board of directors of the Oklahoma Lung association. 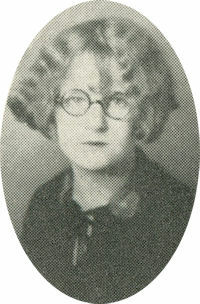 She also had been active in Democrat party affairs in Noble county and served as assistant superintendent of Noble county schools in about 1948-50. Survivors other than her daughter, Mrs. Richardson, include two sons, Martie McQuain Jr., Condon, Ore.; Joe McQuain, Houston, Texas; eight grandchildren and five great-grandchildren.